Discussion in 'Vapor Related Equipment' started by 710Coils, Jun 18, 2018. I am working on setting up some bundles and adding dab tools and cap stands. lazylathe, ew91, Roth and 3 others like this. Wait till you see the shirts.... I am making some with just the logos and no 710coils as I know several have stated they would totally rock it anywhere if it didnt say 710coils. But had the oragami and octopus logos only. Let me know and I will be paying close attention!!! Hogni, ChurroForSure-O, Oogendoogan and 7 others like this. Ultra dope. I’ll buy black and blue. I’m in the logo only camp. invertedisdead, Roth, lazylathe and 1 other person like this. Roth, 710Coils and StormyPinkness like this. Roth and 710Coils like this. I’m a “origami and octopus logos only” dude too, def in black, maybe a grey or the off-white colour too. Do you mean like a light tan or eggshell off-white or very very light gray off-white? TY, Shane! lazylathe, Roth and 710Coils like this. Gonna work on updating all the pics on my site to match the latest and greatest gear. So expect the pics to better match whats for sale and I am also working on bundles!!!!! Hogni, lazylathe, scalescliffs and 5 others like this. The new coil and banger are reeallly nice! My brother, who has been dabbing off my 'old' @710Coils set up and knows nothing about bangers, coils, etc., took a dab off the new set up and immediately asked what I changed. Definitely better flavor and vapor. I'm in for a couple of T-shirts in Lg as well. Got green T's?! ClearBlueLou, Hogni, Roth and 2 others like this. So I placed my order for the axial coil and some clips. The 25mm opaque quartz nail will soon be upgraded from a torch to a nice 'heated jacket'. ew91, Roth, 710Coils and 2 others like this. You went from a 25mm to a 30mm and that made the difference for ya? Still debating whether to go 25mm or with the fat 30mm. ClearBlueLou and biohacker like this. @tepictoton Expect a banger with your coil on me =) That way you will be able to have a torch and dab nail. Hogni, tepictoton, Roth and 4 others like this. nosmoking Just so Dab HAppy! The new axial coil is really nice. So is the taller bucket. My only gripe is I now need longer q-tips it seems. I went from 30mm to 25mm and I think I like the 25mm a little more but time will tell. I am not really sure there is a noticable difference really. invertedisdead, Roth, 710Coils and 4 others like this. @buckhakeesah I have 30mm for both set ups. The newer coil seems to work more efficiently. I don't take giant dabs (i'm guessing .10 or less per dab) and the 30mm works really well. I have it set at ~516f and get 2-3 fat rips with zero pooling. ClearBlueLou, buckhakeesah, invertedisdead and 3 others like this. Finally pulled the trigger on two 30mm opaque's! With axial coil and cap! Out with the old (D-nail) and in with the new (710Coils)! So nice to support a company that supports US! Nothing makes me happier than stellar CS and Shane is ALL OVER IT LIKE IT'S HIS BUSINESS!! Thanks buddy! ClearBlueLou, Hogni, just_the_flu and 11 others like this. To me one of the biggest things lacking from most companies is solid customer service. People can be very understanding when treated nicely and as if they were part of your inner circle of friends and family. I strive to treat everyone with the highest level of service possible on top of solid products with great pricing. MayaMayhem, Hogni, just_the_flu and 11 others like this. I have my temps down to 500 and still getting great hits. Just keep going lower and lower! Beginning to wonder if the damn thing even needs to be on at this point! StormyPinkness, invertedisdead, alltoreup and 5 others like this. lazylathe and 710Coils like this. thedabbingwizard and lazylathe like this. In the meantime I will start drilling more holes in my caps, just in case this proposed 3-way works out. This axial coil and 30mm opaque have changed the game for me...blows away a sic dish and worth the extra maintenance! So much fuller vapor and flavor while lowering temps, and the clip keeps it secured well. Wonder if different colored bands were still coming out? Nothing but good things to say about Shane's customer service. Awesome response time and really helpful with my order along with fast shipping. My favorite setup to date! ClearBlueLou, Hogni, StormyPinkness and 13 others like this. 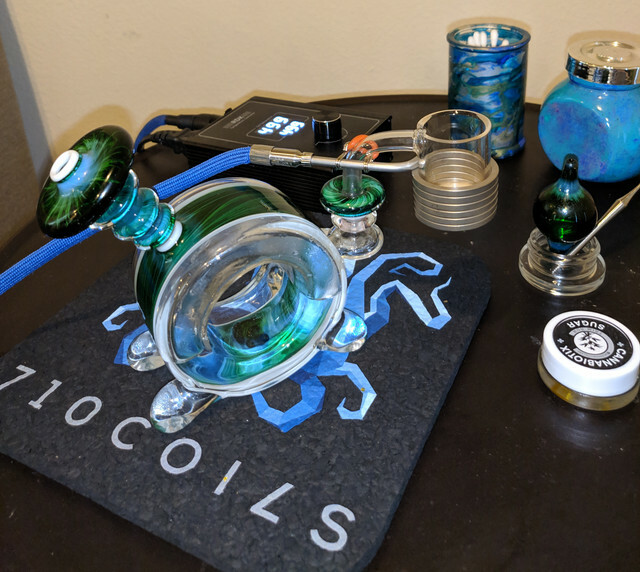 Awesome setup, diggin the Coojo Donut! I gotta try one of these axial coils! grobbo, SilentJ, biohacker and 1 other person like this. So...I need to go lower apparently...I’m too high to remember. Setting a reminder! @grobbo thats a really nice setup. Love the rig! grobbo, SilentJ, invertedisdead and 2 others like this. I am down to 497F on my Auber RDK200 lately with the new 25mm opaque banger and axial coil. I was really liking the 30mm as time goes on I may be finding reasons to go back. Keep in mind I had the OG 30mm opaque banger and OG axial coil but there were 2 major advantages that I feel are becoming more transparent as I use the 25mm setup longer. I don't do large dabs. I can usually get 20-30+ dabs out of a gram easily so thats .05 at the largest but usually more like .025. I find with the 30mm the extra area allows me to finish that dab quicker. I also find less splatter along the walls which helps keep things cleaner. I am not giving up on my 25mm setup yet, but I am cleaning the 30mm and getting it back on deck just in case. superdang9000, SilentJ, invertedisdead and 3 others like this. ClearBlueLou, Hogni, superdang9000 and 4 others like this. grobbo, gunmetalshark, 710Coils and 2 others like this.